IMMACULATE MOVE-IN READY, WAITING ON YOU TO BRING YOUR FAMILY. GORGEOUS 3 BR, 2 BATH HOME NESTLED AWAY IN DENBIGH ON A CUL-DE-SAC. BEAUTIFUL NEW KITCHEN WITH BACKSPLASH & APPL, BATHS, STAMPED PATIO WITH GAZEBO, EXTENDED PARKING PAD AND OVERSIZED 2 CAR GARAGE, FLOORING, PAINT, NEWER ROOF, ALARM SYSTEM, VAULTED CEILINGS, NEW LIGHTING. THE HOUSE THAT JUST KEEPS GIVING! 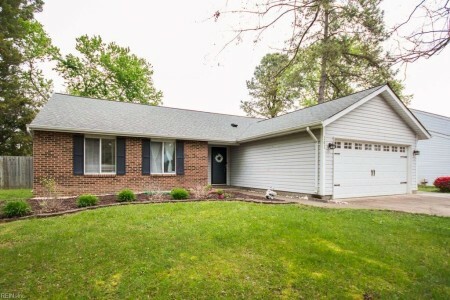 This 3 bedroom, 2 bathroom home located at 141 Chase, Newport News, VA 23608 has approximately 1,500 square feet. It is currently listed for 199900.00 and has a price per sqft of $13,327. This home is currently Active under the MLS#: 10251829. It is listed by Howard Hanna Real Estate Services. 141 Chase, Newport News was built in 1987. It has Garage Att 2 Car, Oversized Gar, Multi Car, Off Street parking. The kitchen includes Dishwasher, Disposal, Dryer Hookup, Microwave, Elec Range, Refrigerator, Washer Hookup.